A multi-million pound scheme to provide Suffolk with six new fire stations, refurbish four more and build a new training centre is set to be approved. Suffolk County Council's cabinet committee are being asked to give final approval to the private finance initiative (PFI) scheme on 29 May. 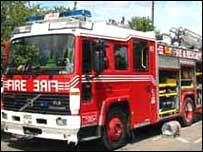 The scheme would see two new full-time fire stations in Ipswich and Lowestoft. It would see four new retained fire stations Lowestoft, Hadleigh, Nedham Market and Nayland. The new training centre is being planned for Great Blakenham, near Ipswich. Four fire stations at Bury St Edmunds, Sudbury, Haverhill and Felixstowe would be upgraded and refurbished. The fire stations will be built by a private firm - which will be paid an annual fee by the county over a 25-year period. A report to the council said the government is expected to provide about £30m towards the scheme. If the scheme is approved, building work is due to start early in 2008.